Win McNamee/PoolChristine Blasey Ford, a California professor, has accused Supreme Court nominee Brett Kavanaugh of sexual assault. Senate Judiciary Committee Chairman Chuck Grassley is questioning Christine Blasey Ford’s truthfulness regarding allegations Supreme Court nominee Brett Kavanaugh sexually assaulted her. An ex-boyfriend of Ford’s, whose identity remains anonymous, provided a written statement that seemingly contradicts claims she made while testifying before the Senate Judiciary Committee September 27. Grassley sent a letter to Ford’s lawyers demanding they provide key materials. Ford’s legal team says she stands by her testimony. Republican Sen. Chuck Grassley questioned California professor Christine Blasey Ford’s truthfulness after an ex-boyfriend of Ford’s provided a written declaration that in part contradicts claims she made before the Senate Judiciary Committee last week, according to a Fox News report. The statement, in which the ex-boyfriend’s name is redacted, said Ford once helped a friend, Monica McLean, prepare for a polygraph examination. The ex-boyfriend in his statement also said Ford never mentioned Supreme Court nominee Brett Kavanaugh, who Ford said sexually assaulted her at a high school party when they were teenagers. Additionally, Ford’s ex-boyfriend said she never claimed to be a victim of sexual misconduct. The statement also said Ford never mentioned a fear of flying and claimed she had no problem living in a small apartment at one point in Washington, DC. 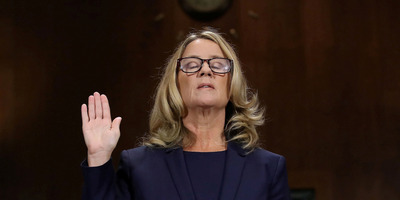 During her testimony in the capital, Ford said she’d originally hoped to be questioned in California given her anxiety surrounding air travel, but acknowledged she’s often travelled via plane for work and pleasure. She said the alleged assault involving Kavanaugh led her to fear confined spaces. As a result of the ex-boyfriend’s statement, Grassley, the chairman of the Senate Judiciary Committee, wrote a letter to Ford’s legal team demanding it turn over materials that would corroborate her allegations, including therapist notes from 2012 during a session in which Ford discussed the alleged assault. “Your continued withholding of material evidence despite multiple requests is unacceptable as the Senate exercises its constitutional responsibility of advice and consent for a judicial nomination,” Grassley wrote in the letter, which was sent Tuesday evening. Her legal team also provided a statement from McLean, who rejected the claim that Ford once helped her prepare for a polygraph. “I have NEVER had Christine Blasey Ford, or anybody else, prepare me, or provide any other type of assistance whatsoever in connection with any polygraph exam I have taken at anytime,” McLean wrote. Senate Majority Leader Mitch McConnell has said the Senate will vote on Kavanaugh’s nomination this week. The FBI is continuing its background investigation into the allegations against Kavanaugh. Ford’s lawyers released a statement on Wednesday afternoon that said they would provide the materials Grassley requested if the FBI contacts and interviews her.